Shiso Tree Cafe might be the only store in Toronto that does Japanese and Italian fusion food, and I’m hooooked. In J-Town, there is a supermarket, including a bakery and a few little small shops within that supermarket. Several other restaurants there including Izakaya Ju, and some cafes. There is a small garden with a fountain in the middle, which gives a really nice vibe. The area is actually pretty small and pathetic 🙁 and I wish we had formed a bigger area for J-Town in this location! After failing an attempt to come to Shiso Tree Cafe the previous time, we made sure to come in before they close for dinner time. 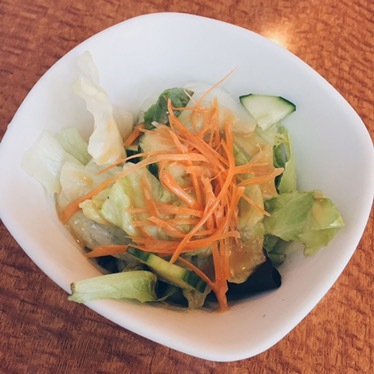 Dropping by for lunch, their lunch menus consist of salad, soup and a choice of entree. 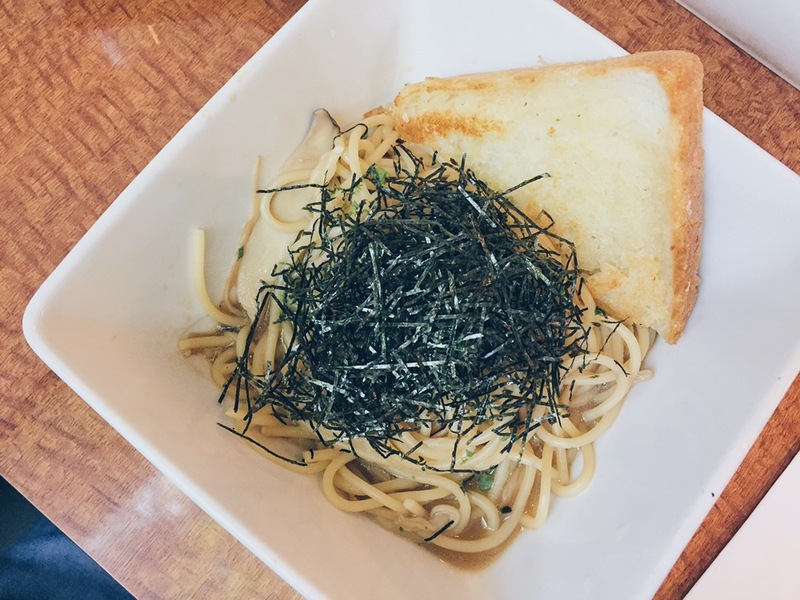 Shiso Tree Cafe is known for their pasta, but also has choices like chicken katsu with rice, salads, udon, and Japanese fusion poutines. 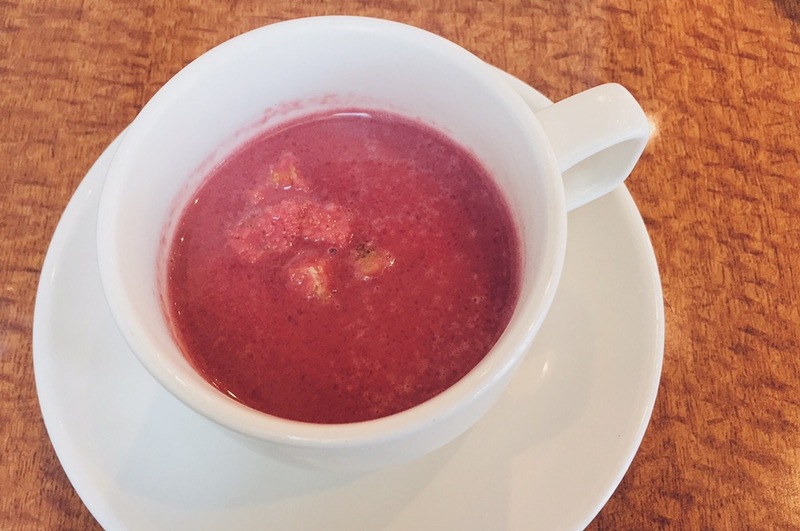 The soup was served in a cup, not a bowl. So serving is relatively small, but it was fine since the price was so cheap for this amount of food! I’m not sure what this soup was as the waitress just plopped it on the table with no indication of what it was. To me, it tasted like it had potatoes and beets in it. The soup was just decent but I’m not sure if I would ask for seconds. My Shoyu Mushroom pasta came first and it looked absolutely yummy! The serving bowl was in a good size and I liked the type/style of bowl they used. My Shoyu Mushroom had different types of mushrooms and the sauce was more watery than the Carbonara sauce which helped made my pasta slurpy and I liked that. The sauce wasn’t overpowering, plus both the seaweed and mushrooms added a bit more flavour towards an potentially bland meal. L ordered the Carbonara pasta, which came shortly after mine. The Carbonara pasta came with bacon, egg and parmigiano reggiano cheese. It just tasted alright to me, nothing special. 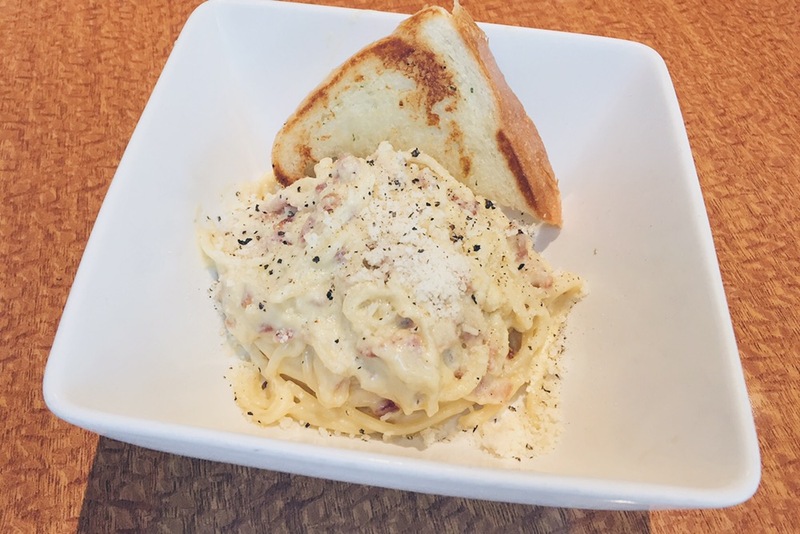 Carbonara is always a safe choice in any pasta situation in my books. But I much prefer my Shoyu Mushroom pasta. We also got a poutine to share! This is their Japanese Poutine which consisted of dashi gravy, cheese curds, green onion and nori (shredded seaweed). It sounded just like a regular poutine with slight tweaks but it tasted better than I thought. The dashi gravy is actually pretty light compared to some other restaurants where the gravy is really thick, heavy and clumpy. I like the dashi gravy better. Whereas the nori gives it a slight differ in taste, and a slightly crunch along with the fries. 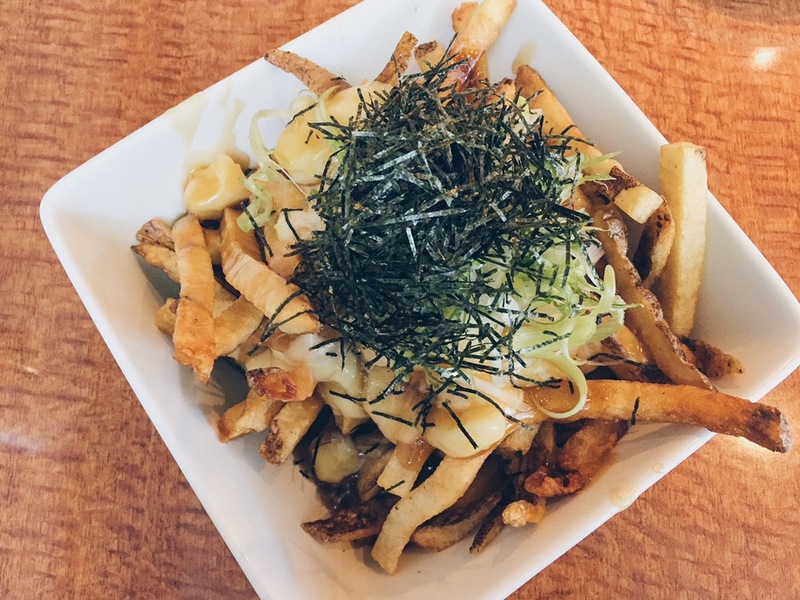 It is a different take on regular poutine but I like it more because of how light dashi gravy makes the poutine. It makes it easy to keep eating more without feeling sluggish. For lunch, each meal set came with salad, soup and a choice of your entree (not including the poutine, haha)… This entire meal cost about $8-10, and for this much food, it’s such a steeeeeal! Without the poutine, I was satisfied at the end of the meal, but not full. Perhaps I was really hungry upon coming here, but the poutine made me full and happy. I would definitely come back again just to try out more of their pastas, since they have a variety of them, and even maybe another poutine since they had some really intriguing flavours. PS: They close at 2.30PM, after their lunch period and reopen again at dinner time, which I think is about 5PM. If you know any more places that sells similar foods to Shiso Tree Cafe, let me know!